This weekâ€™s enews focuses on music streaming, with the release of the annual global Digital Music Report, pointing to a rapid uptake in music subscriptions. The sector is adapting to this transformative change and the report below showing how orchestras are responding will be of interest to many of you. Weâ€™re always pleased to hear from you and to share your activities with our readership, so please email us at marketing@mca.org.au If you want to hear from us more often follow us on Facebook and Twitter where we post the latest news, opportunities and events we come across in our daily travels. The Music Council of Australia eNews is divided into a 6 sections. Scroll through or, if you wish, click on one of the sections to be taken straight to those stories. International recorded music industry and lobby group IFPI (the International Federation of the Phonographic Industry) has released its annual Digital Music Report. This is a rich report full of facts on the global state of play. It shows strong growth in digital sales in 2013 with a 50% increase in revenue from subscription services, passing the US$1 billion mark for the first time IFPI notes that 28 million people paid for a subscription in 2013, up from 20 million in 2012 and 10 million in 2010. Despite these gains, the global music market reduced in 2013 by 4%, mainly impacted by a big drop in Japan, a market in transition. Global physical sales also continue to decline, comprising 51% of total revenues in 2013, down from 56% the year before. An Australian case study on the IFPI website notes that last year our digital sales (54%) overtook physical for the first time. However the growth in digital is not yet enough to match a continued drop in physical sales. Australian music revenue declined by 11% in 2013, after a slight increase the previous year. Across the world, many classical music organisations diversifying in order to connect with audiences and to build their brands. The New York Times recently looked at digital streaming initiatives across a number of US and European orchestras. They profile the Detroit Symphony whose ambitious new digital streaming initiative underpins a strategy to turn the beleaguered organisation around. They now stream more concerts than any other US orchestra, facilitated by an agreement reached with musicians, making it a viable proposition. While the concerts streamed by the Detroit Symphony are free, paid subscriptions are also on the rise. The Berlin Philharmonic has 18,000 subscribers who pay $20 per month to access all their live concerts and digital archive. As the paper notes â€œno one is sure whether the trend will succeed at making money or building audiencesâ€, however it is increasingly clear that embracing this new reality is essential for almost any musical venture. Read the full article here. Hello Stage is a new online music platform for the classical music sector that serves to connect musicians and ensembles with managers and promoters. Artists can create personalised web pages on Hello Stage, featuring details of their repertoire and calendar. With almost everyone engaged on at least one social media platform it is hoped that Hello Stage becomes the LinkedIn for the classical music market. It is a specialised product which makes the classical music market much more transparent and interactive, a portal that would launch and promote artists, who would benefit from having a stronger professional online presence. International Arts Manager takes a more in-depth look at this new platform. QMusic has opened artist applications and registrations for this yearâ€™s Big Sound music conference, to be held in Brisbane from 10 â€“ 12 September. Over the past decade Big Sound has grown into Australiaâ€™s largest contemporary music gathering. This respected event offers a great mix of conferencing, panel sessions and artist showcases in local music venues in the heart of the Fortitude Valley music precinct. MCA members enjoy a $100 discount and early bird registrations are now open. Regional Arts Australia is tendering for a new organiser for its national online and live music performing arts touring showcase platforms. Known as Cyberpaddock and Long Paddock, these are Australiaâ€™s main mechanism for showcasing performing arts productions designed to tour. There is an opportunity here to take touring to the next level. From a music point of view this would be great thing, as music touring can fall between the cracks in our current performing arts landscape. Of course, touring is always complex and multilayered, particularly in a country as vast as Australia, with multiple stakeholders, and so many superb dance, theatre and music productions all keen to hit the road. Weâ€™d be delighted if these new mechanisms can strengthen Australian music touring. Tenders close on 5 May. PPCA and the Australia Council for the Arts have recently announced recipients of 5 one-off recording grants worth $15,000 under a new partnership between the two organisations launched in October 2013. The grants were established to assist local artists to create new sound recordings and were awarded across a range of genres from soul and roots to classical and contemporary singer-songwriters. Well done to Courtney Barnett, The Grigoryan Brothers, Lance Ferguson (from The Bamboos), Ben Salter and Ainslie Wills. Peter Tregearâ€™s platform paper is a call for a more informed and enlightened discourse about tertiary music education is a timely one. Prof Warren Bebbington, Vice-Chancellor of the University of Adelaide, former Dean of Music at the Universities of Melbourne and Queensland. Reviews Peter Tregearâ€™s Enlightenment of Entitlement? 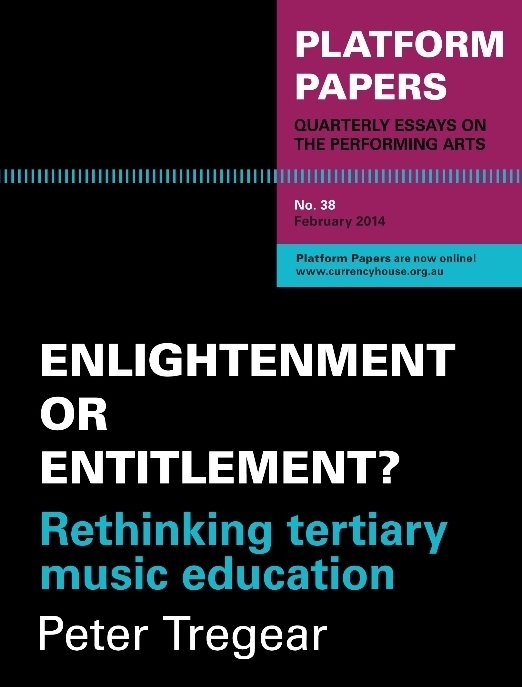 Rethinking Tertiary Music Education. This is a Platform Paper published by Currency House. Read the review at the Music Forum Journal Website. New Australian research released by the University of Sydney and the Australia Council reports the importance of arts participation on studentsâ€™ academic outcomes. The study looked at 643 primary and secondary school students from 15 schools over two years. Researcher Michael Anderson noted in The Conversation that â€œThe research found that students who engaged with the arts in schools as active participants â€“ as makers and doers of the arts â€“ were more likely to do better in academic and social spheres than those who passively consumed the artsâ€. View a YouTube clip outlining the project here. National Advocates for Arts Education, of which MCA is a member, recently met with Education Minister Christopher Pyne in Canberra to discuss the Governmentâ€™s review into the Australian Curriculum. NAAE put the case for arts education, including support for the national curriculum. Minister Pyne confirmed the Arts would be included in the Review; expressed interest in a teacher education model that encourages primary teachers to specialise in particular curriculum areas, including the Arts, Science and Languages; and encouraged NAAE to work with State and Territory Education ministers in implementation. Read MCAâ€™s submission to the review into the Australian Curriculum here. "I can recommend music as a path in life. You can do it in your spare time, the way Einstein did, the way millions of people do. I know bricklayer blues guitarists and rapping lawyers, jazz guitarist doctors and opera-singing scientists. Theyâ€™re all great artists. Or, you can do it full time, like I do. To be a musician, you have to have talent, and you have to have vision, and contrary to popular opinion, you need to work hard at it too." Harry will work with the 5 talented students below and Program Ambassador, John Foreman, to write this year's song. We can't wait to see what they come up with! Arts OutWest is passionate about supporting local practitioners to make their creative careers happen. In April they are launching The Portfolio Project which is a series of one day workshops taking place throughout Central West NSW to help creative practitioners get their online presence up to date. To apply for a spot in the workshops visit the Arts OutWest website. Reconciliation Australia has launched a competition encouraging people to come together to sing, perform and share songs about reconciliation. As part of the program Reconciliation Australia has collected a number of previously unpublished songs about reconciliation and associated issues. These songs form the Sing Loud! playlist for people to listen to, download the sheet music or chord charts, and record their performance. They are then encouraged to share it with a wider audience by posting it on the Sing Loud! website either before or during National Reconciliation Week, 27 May - 3 June. There are prizes for people who write, record and submit their own song and also the best cover song. To view the songs and participate visit the Reconciliation Australia website. Laugh for Arts is a fundraiser for the Arts Law Centre of Australia, the national community legal centre for the arts, providing important legal advice and advocacy for artists and arts organisations (particularly emerging artists who are unable to pay for legal advice). An important service is 'Artists in the Black', which provides advice to Aboriginal and Torres Strait Islander artists about their rights in relation to a broad range of issues, but in particular IP issues. 8 April 2014 at the Windsor on the Park, Sydney. Book tickets here. In 2014, The Seed Fund turns 10 years old, continuing to support emerging musicians, artists and arts workers via three grant categories, and two initiatives. Applications close 5 May. Visit The Seed Fund website. Applications are now open for Arts NT Quick Response Scheme, offering up to $1500 per grant to a max of $2000 per financial year to access arts and cultural opportunities as they arise. For more information click here. PRS for Music Foundation funding program for women music creators, Women Make Music, is now open for stage 1 applications. Funding can be used to assist with the costs of the first performance and/or the fee for the music creator, and support is available for music written by UK-based creators working in any music genre. Applications close 28 April. For more information and to apply click here. This Australian prizes honour distinguished achievements by Australian academics, practitioners, philanthropists and policy makers in HASS (Humanities, Arts and Social Sciences) areas, and draw international attention to Australiaâ€™s achievements in HASS. In 2014, there will be four prizes: a book that enriches Australian cultural and intellectual life; an exceptional artistic performance, exhibition, film, television show, play, composition or practical contribution to arts policy; a Future Leader who demonstrates leadership skill and potential in the arts, humanities and social sciences; and a Student. Submissions close on 30 June. APRA members can now nominate for the Blues and Roots Work of the Year award. If you have released a blues and roots song or album between 1 July 2012 - 31 December 2013 and it has been played on the radio, broadcast on TV, digitally downloaded or streamed, you can nominate. Nominations close on the 22 April. Find out more here. Applications are open for The Brian Stacey Award for emerging Australian Conductors as part of the Helpmann Awards 2014. Entries close 6 May. The winner will presented with an $8,000 prize and will appear at the Helpmann Awards Ceremony. Visit The Brain Stacey Award website to apply. JM Jazz World is organised by Jeunesses Musicales International (JMI). This leading international youth jazz orchestra is looking for talented musicians aged 18 - 26 for its 2014 programme. The orchestra is looking for saxophonists, trombonists, trumpeters, hornists, tubists, guitarists, bassists, drummers, pianists and vocalists. Deadline for applications are 11 April. To find out more click here. Arts Activated brings together leading thinkers, artists, advocates, practitioners and producers, with and without disability, from across Australia and overseas. Working together to strengthen Australiaâ€™s arts and disability sector, Accessible Arts is calling for proposals for papers, performances or workshops that address the 2014 conference theme, Creative Connections. Papers are due 28 April. To find out how so submit a proposal visit the Accessible Arts website. Registrations for the International Society for Music Education (ISME 2014) World Conference in Brazil 20-15 July are now open. Visit the ISME 2014 Conference Website. Major Performing Arts (MPA) Education Network Conference will be held in Brisbane on 30 June â€“ 1 July. The two day forum of the Major Performing Arts (MPA) Education Network discusses the latest crucial issues in arts education, including the latest developments in the National Arts Curriculum. It is also open to other education personnel from key performing arts companies. For more, visit the APAM website. The World Congress of Music Therapy is held every 3 years. Music therapy professionals from around the world gather at the congress to share ideas, experiences, trends and research outcomes. The theme of the World Congress of Music Therapy is Cultural Diversity in Music Therapy Practice, Research and Education. Conference dates are 7-12 July. For more, visit the conference website. The Melbourne International Jazz Festival is looking for a Sponsorship & Philanthropy Manager. Applications close 10 April. For more, visit the Festival website. Opera Australia is looking to hire a Marketing Manager for a 2 year contract. Applications close 9 April. For more, visit the Opera Australia website. The City of Sydney is looking to hire a Strategy Advisor â€“ Live Music & Performance. Applications close 7 April. To view the position description, visit the careers page on The City of Sydney website. Universal Music Group (UMG) is currently looking to hire a Repertoire Manager to join their Strategic Marketing team on a 12 month contract. The role is based at the Sydney head office. Applications close 11 April. Visit the Universal Music Group website to apply. Universal Music Group (UMG) is currently looking to hire a Community Strategist. Applications close 10 April. Visit the Universal Music Group website to apply. Australian Centre for the Moving Image (ACMI) is hiring an AV technician. Applications close 13 April. For more information and to apply, click here. The City of Gold Coast is seeking expressions of interest from suitably qualified and experienced people interested in becoming a Director of The Arts Centre Gold Coast (Gold Coast Arts Centre Pty Ltd). Applications close 15 April. For more, visit the City of Gold Coast website. Sistema Scotland is looking for inspirational and visionary musicians and teachers to join both the Big Noise Govanhill team in Glasgow and the Big Noise Raploch team in Stirling, based on the internationally celebrated Venezuelan El Sistema programme. Applications close 21 April. Click here to find out more. Scottish Opera seeks a Heritage Engagement Manager to develop and implement a broad range of heritage activities associated with the Theatre Royal Glasgow. Applications close 7 April. Visit the Scottish Opera website to apply. Guildhall School of Music and Drama London is looking to hire a Coordinator for Strings and Music Therapy. Applications close 22 April. Click here to find out more. 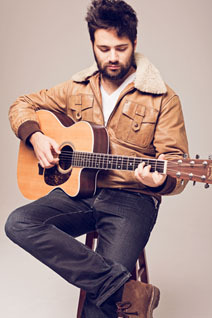 Copyright Â© 2014 Music Australia, All rights reserved.